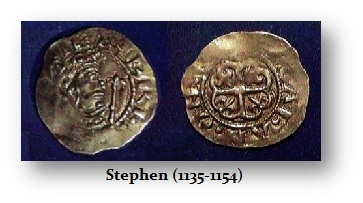 Stephen was the son of Stephen, Count of Blois, by Adela, fourth daughter of William the Conqueror, was born in 1104. 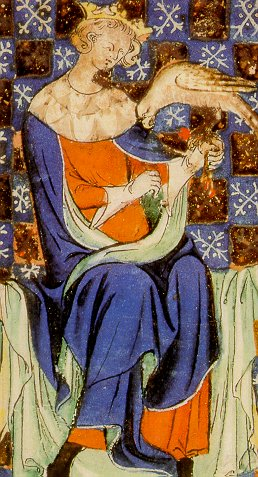 On the death of Henry I he immediately came over from Normandy to England; and laid claim to the crown, although he had been one of the most zealous in taking the oath for securing the succession to Henry’s daughter, the Empress Matilda. By the aid of his brother who was bishop of Winchester, he possessed himself of the royal treasure, and was enabled to bribe some of the most restive of his opponents while he sought the support of the people at large by promising to restore the laws of Edward the Confessor. After a war with the Scots, who were finally defeated at the famous battle of the Standard, the Empress Matilda landed in England with her brother, the Earl of Gloucester; and being joined by several powerful barons, a civil war ensued, which for cruelty and devastation proved one of the most calamitous in the annals of the country. After various turns of fortune, Matilda retired to Normandy, and the contest was carried on by her son, Henry Plantagenet, who in 1153 landed an army in England. Being joined by the barons of his mother’s party, the competitors met at the head of their respective forces at Wallingford; but an armistice took place instead of a battle; by which it was agreed that Stephen should reign during his lifetime, and that Henry should succeed him. In the following year Stephen died, aged 49.